O piso térreo tem um banheiro com vaso sanitário, chuveiro e máquina de lavar roupa; A cozinha espaçosa e confortável sala de estar com uma área de jantar aconchegante. Da cozinha uma escada de madeira leva ao andar superior. No final do corredor leva você em uma elegante sala com cama de casal. Na porta ao lado, após a abertura do velho, porta maciça, você entra no segundo quarto com 2 camas de solteiro. O gramado em frente da casa é adjacente a um jardim da casa bem cuidada. Estar em torno da casa convidam a ficar. Desfrute das vistas e do canto dos pássaros nas matas próximas. Cerca de 400 metros da casa é a área de churrasqueira coberta. A estadia foi mesmo o que estávamos a precisar. Paz e descanso, perto da natureza. O local é muito bonito, no meio do campo, das pastagens de erva fresca onde pastam as vacas, cabras e ovelhas. É o local ideal para quem quer acordar com o tilintar dos chocalhos das vacas! Todas as caminhadas que fizemos foram fabulosas. Berna fica a menos de 50km. A Elizabeth e o Fritz foram espetaculares! É bom acordar e ter leite fresco para o pequeno almoço! Eine sehr schöne und ruhig (einellage) gelegene Ferienwohnung mit netten Vermietern, die sich auch sehr um unsere kranken Kinder gekümmert haben (Arztsuche uns.). Da es ein altes Bauernhaus ist ist alles in Holz und die Decken sind nieder, aber das macht es auch heimelig. Im Winter muß man ins Ski Gebiet mit dem Auto fahren (Winterreifen und Ketten mitführen) , dafür geht ein Schneeschuhtrail der fast direkt am Haus vorbei führt ! Alles im Allem toll !!! Wir waren eine Woche mit zwei Kleinkindern (1 und 3) auf dem Bauernhof und es war super. Die Ferienwohnung ist einfach und schön eingerichtet, es ist alles drin, was man benötigt. Der Bauernhof ist sehr sauber und sehr gepflegt, was einen tollen Eindruck hinterlässt. Die Kinder durften mit im Stall helfen, überall herumstiefeln und durch die fast verkehrsfreie Straße musste man auch nicht immer hinter ihnen her sein. Der Ausblick ist sehr weit und toll, außer wenigen Flugzeugen ist echte Ruhe und Stille. Wir können einen Urlaub nur empfehlen. So how about this for a surprise! Just outside of Trub we left the road and had to drive past some gates to find ourselves on a paved road going uphill for about 2 kilometers. But once we were on top we had the most beautifull view you can imagine. And right away we were welcomed by the hostes which was just an addition to the already nice surpise. The house was big enough although the upper floor was slightly to low for my 1.87 meter length. In the room you can find anything you need, even tourism maps which were left behind by others. One thing which I can advise is to use the laminated hiking routes to get around and see the area. This way we also got in contact with the neighbour farmers and all of them were friendly and open for a chat. So anywhere we went, we never had the feeling of unwelcome. So if you have a chance, want to enjoy the piece and quietness and do not mind driving a farmers road uphill, please do yourself a favor and go here for a change. Die Wohnung ist einfach, aber vollständig ausgestattet. Man kann dort einen wirklich ruhigen Urlaub verbringen, fernab von jeglichem Zivilisationslärm und Hektik. Man hört nur die Kuhglocken. 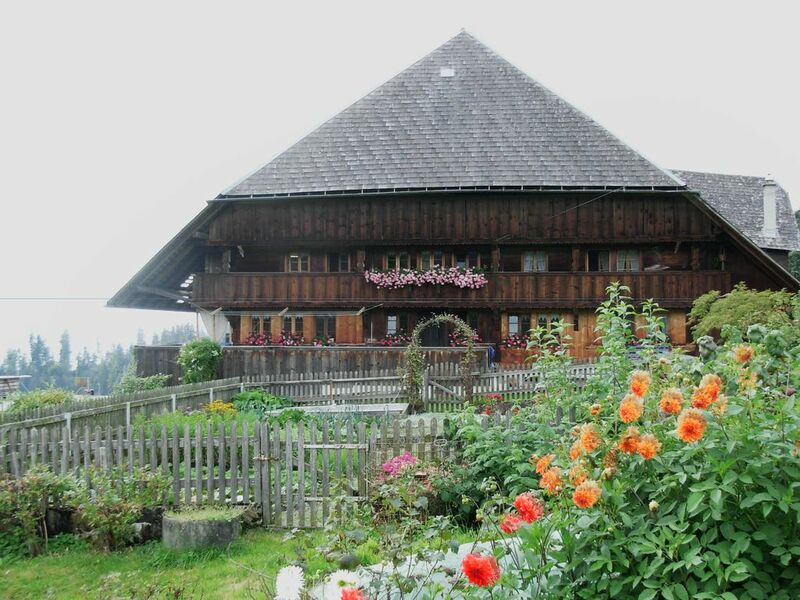 Das Haus ist ein typischer Emmentaler Einzelhof, erreichbar über eine schmale Bergstraße, mal schnell in den Laden fahren, weil man was vergessen hat, geht nicht, dazu ist es zu weit. Es handelt sich um ein altes Haus, vor allem im oberen Stock dürften größere Gäste Probleme mit der Höhe der Deckenbalken bekommen. Wer nachts immer mal raus muss, sollte sich darauf einstellen, dass er eine relativ steile Treppe runterlaufen muss. Die Gastgeber sind sehr herzlich und man fühlt sich willkommen. Alles in allem ideal für Zivilisationsgeplagte, die Abstand suchen. I recently stay at this apartment and it was great. Elisabeth and her husband were great. They speak very little English, but we managed. I stayed with a friend of mine and her 4 year old son. The place was clean and spacious. We were able to purchase fresh eggs and milk from Elisabeth. It is outside of town, you need a car, but what a peaceful place to stay. Coffee outside with the incredible view to look at is worth it! Easy drive to Lucerne and Interlaken for day trips. Os verdes colinas, em parte densamente arborizadas do Emmental convidamos você a dar longas caminhadas ou passeios curtos. A trilha começa na porta do hotel. Já depois de alguns passos que você pode desfrutar da magnífica vista sobre os Alpes de Berna. Nossa fazenda está situada no coração da Suíça e fornece um ponto de partida para muitas excursões por todo o país. Trub: trilhas para caminhadas, pista de raquetes de neve, esqui cross-country, história igreja do mosteiro, a localização da 'tardia Bloomers' e 'The Avengers', Berghotel Napf, o telhado do Emmental (1408m.ü.M.). Langnau (15 km): piscina interior e exterior, pista de gelo, mini golfe, mercado do agricultor. Marbach (13 km): gôndola elevador para o Marbachegg, parapente em tandem vôo, caminhadas, carrinho aventura, búfalos e queijo especialidades, esqui cross-country, esqui e snowboard escolas, trilhas com raquetes de neve, ski lift.